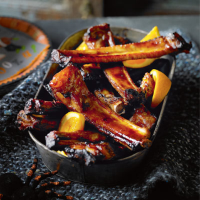 Pile up these sticky skeleton bones on a platter with orange wedges tucked around. Serve with plenty of napkins as they’re juicy! 1. Layer the meat in a shallow non-metallic dish or large, plastic seal-able food bag. Mix together the rest of the ingredients. Pour the mixture over the ribs and turn to coat. Cover loosely, or seal, and chill for 2-4 hours. 2. Preheat the oven to 180°C, gas mark 4. Transfer the ribs to a large roasting tin and pour in the dish juices. Sprinkle with a little salt and bake for 1½ hours. After 45 minutes cooking, start basting the ribs with the pan juices. The ribs are done when the meat falls easily from the bone. 3. Pile the ribs onto a serving plate. Heat the pan juices on the hob for 3-4 minutes until thickened. Pour this over the ribs and serve. This recipe was first published in October 2011.